As we progress forward into meteorological summer, there will be significant alterations to the pattern of the previous 6-8 months. A super El Nino – arguably the strongest one on record as per certain metrics – will be collapsing rapidly over the next several months and subsequently reversing into a predominately cold ENSO state (La Nina). Significant cooling of tropical Pacific sea surface temperatures has already occurred with most ENSO regions now nearing neutral (SST anomaly close to 0). 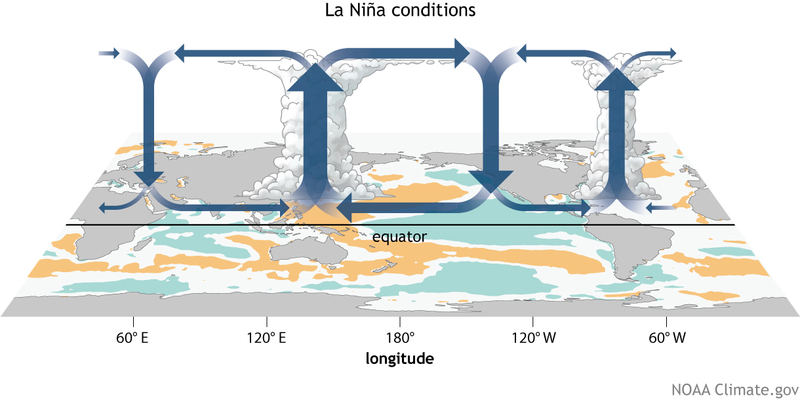 The haste with which the El Nino transitions into a La Nina regime will aid in determining the mean structure of the atmospheric circulation pattern. Tropical easterly trade winds have intensified as a consequence of shifting pressure patterns and a reorientation of the walker cells. The former of which can be evidenced by the increasing frequency of positive Southern Oscillation Index (SOI) values, indicative of declining atmospheric pressure in the tropical Pacific and rising atmospheric pressure near Australia. This creates a large scale easterly flow in the Pacific. The latter of which (shifting walker cells) can be evidenced by the variation of the upper level atmospheric divergence, suggestive of the mean location of tropical convective forcing. An invaluable proxy for which is the 200hpa velocity potential – clearly translating westward with time. Model prognostications are suggestive of an increased proclivity for Indian Ocean and Western tropical Pacific upper level divergence, consistent with a La Nina regime. Concomitantly, the atmospheric angular momentum will be decreasing over the next few months, reflective of an El Nino to La Nina collapse. The sensible weather consequences of such a shift will be widespread, with significant ramifications on the mean ridge/trough pattern over both the United States and northern hemisphere. Given the likelihood of a developing La Nina for the summer months (probably further intensifying into a moderate La Nina for the autumn), the declining AAM, alterations of the mean Pacific tropical forcing and atmosphere pressure patterns, one can ascertain the likely mid/upper level result. However, specifics will – of course – be highly indeterminate due to the chaos of the system. Other not insignificant variables under consideration are the Pacific Decadal Oscillation (PDO) and Atlantic Multidecadal Oscillation (AMO). These indicators, particularly the latter, tends to influence and feedback on the large scale atmospheric circulation pattern more than it does during the cold season. The PDO has been strongly positive (positive for the past two years) and will continue to persist in a warm/positive state for the next few months at least. Conversely, the Atlantic will not be as robustly warm/positive, but should still maintain a slightly warmer than normal state. The combination of the aforementioned variables are examined in conjunction with a survey of prior years in order to ascertain potential commonalities, from which clues can be derived for the future weather pattern. As an aside, one may notice that analysis of northern hemispheric blocking potential was avoided. This is because – unlike the cold season – the correlation of indices such as the NAO/AO to the sensible weather pattern in the United States is not as strong. The East Pacific Oscillation (EPO), namely, the geopotential height anomaly pattern in the Alaskan, W Canadian, East Pacific region tends to be slightly more influential; however, even it, is not nearly as pivotal as in the winter. With that being noted, the northern hemispheric indices are still examined with moderate scrutiny as their effects can be crucial when coupled with other mechanisms. The expectation for the meteorological summer in terms of the global regime is: 1) a transition into a weak La Nina ENSO state by mid-summer; 2) predominantly positive to strongly positive PDO; 3) slightly positive/warm AMO; 4) Declining AAM with its concomitant GWO impacts; 5) Negative EPO initially, transitioning into a predominantly neutral to positive EPO modality; and, 6) Negative AO/NAO initially, becoming increasingly positive for mid to late summer, thus averaging near neutral. One must still adjust these analog years to correct for disparities in the present pattern; however, one can derive important clues pertaining to the evolution of the mean ridge/trough pattern. Mean ridging in the Mid-west with tendency for lower heights in the South. A positive NAO during the summer yields a strong inverse correlation with respect to temperatures in the Southern US, implicating a +NAO should produce cooler temperatures relative to normal in the deep South. If a positive NAO develops, it will follow the general theme of the analogs with a warmer north / cooler South propensity. The analog temperature pattern yielded a very warm result for most of the North, and cooler in the South. 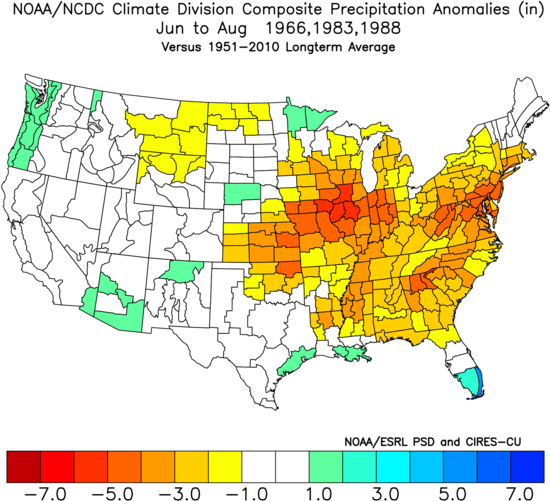 The precipitation departures for the analog years are clearly reflective of the overall temperature pattern – cooler areas in the South wetter, while much of the North is drier. 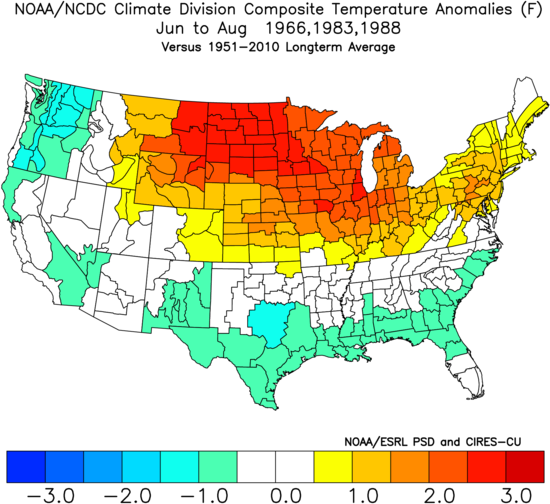 The analogs are corroborated by several seasonal forecast models, which indicate the likelihood of widespread warmth or dual mid-level ridge centers inducing above normal temperatures – in the Western US and another in the Mid-west/East, with a weak trough in the central US. 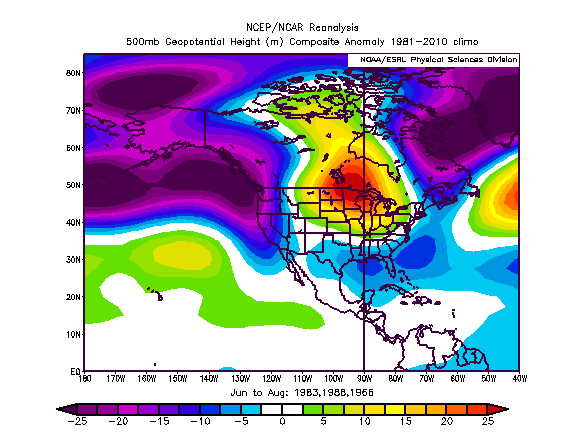 Adjustments from analogs: 1) Less positive NAO; 2)Slightly less negative EPO; 3) More expansive warmth in the Southeastern US; 4) Stronger warmth in the Western US; 5) Wetter across the immediate Southeast US coast due to tropical cyclone activity in late summer. Early season blockiness – particularly in the EPO domain – will destructively interfere with protracted heat spells in the Northeast, although, an overall regime of near to above normal temperatures is still anticipated. The residual hemispheric heat as a consequence of the collapsing super El Nino will make it exceptionally difficult to force a prolonged cooler than normal period over an expansive geographic area. Temperature anomalies in the South were adjusted upward versus analog years due to the background global / climate state and expected pattern progression. The expectation is for progressively declining heights in the EPO domain as June nears its close, particularly for July and August. Geopotential heights should be higher relative to normal across the Northern US with closer to normal heights in the South, consistent with the analog package and the noted EPO / NAO / AO mean state. July should be very hot relative to normal across much of the United States, potentially featuring severe, protracted heat waves, especially in the Mid-west, Southeast and East. 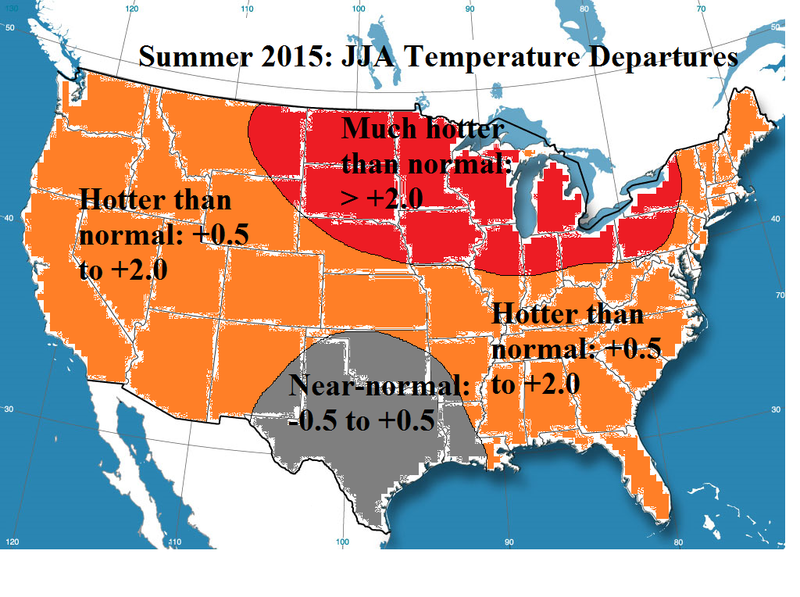 The Pacific NW should see some heat as well. August may feature a subtle retrogression of the mean ridge/trough axes such that more transitional intervals are permitted in the Northeast. However, all three meteorological summer months are expected to finish above the normal, with July likely the hottest relative to normal (possibly around +2 in much of the I-95 corridor, with August potentially similar, and June closer to +1). The official forecast will focus specifically on the seasonal three month departure; however, as inter-monthly variability is such that it precludes one from deriving sufficient value from long range monthly departure forecasts. The precipitation pattern should be wetter than normal in the Texas/Deep South and Florida/SE immediate coast, the latter due to tropical cyclone activity. Cape Verde activity should be suppressed while contemporaneously in-close cyclone genesis is heightened this year. I expect a fairly active Gulf of Mexico/Caribbean and W Atlantic cyclone season. Drier than normal conditions look likely over much of the rest of the United States, but that doesn’t preclude occasional outbreaks of strong to severe T-storms. Insufficient skill exists with respect to T-storm forecasting; however, if the mean mid-level ridge situates itself in the Mid-west, at times, there could be elevated mixed layer (EML) ejections eastward and into the Northeast (an important variable for strong convection). That is speculation, however. The idea of nationwide warmth with departures of > +2.0 across much of the Mid-west, Great Lakes and into the Mid-Atlantic/Northeast verified. Additionally, the forecasted progression of near normal June, and hot/very hot July-August, particularly centered in the Mid-west and East, worked out correctly. In fact, conditions were slightly hotter than expected overall on the East Coast. 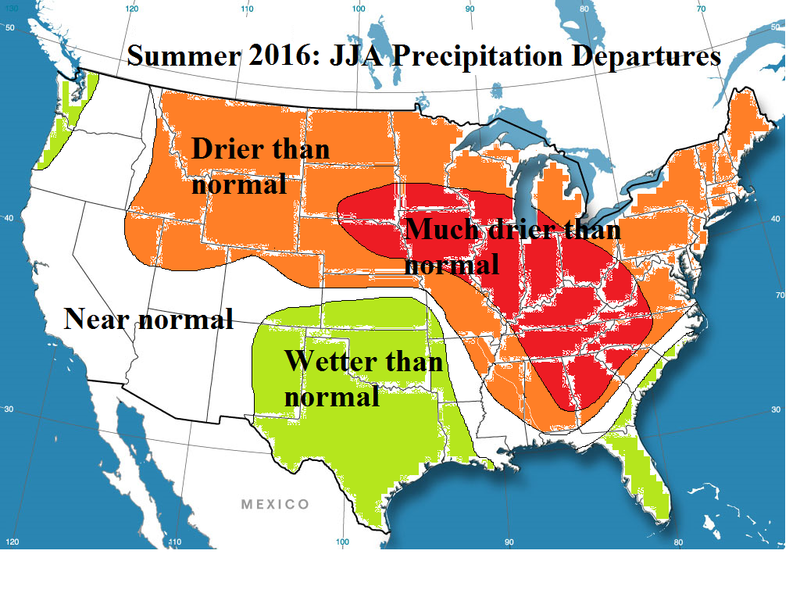 In terms of precipitation, the anticipated dry summer overall verified, with wetter conditions in the nation’s mid section. 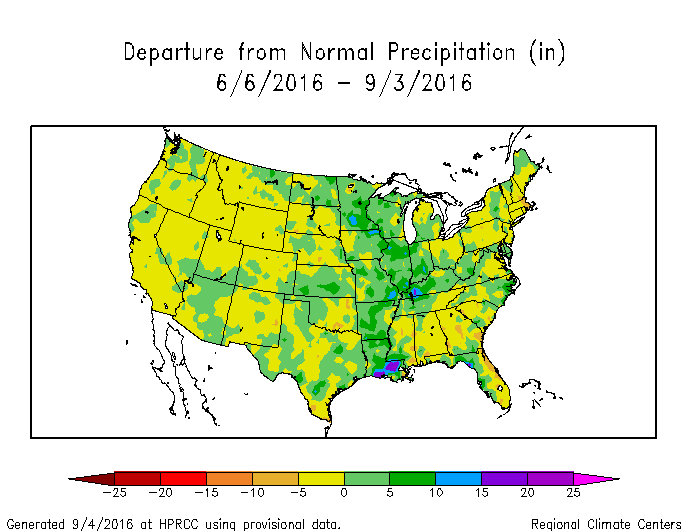 One flaw was that the wettest weather / above average pcpn departures were a bit further east than anticipated. 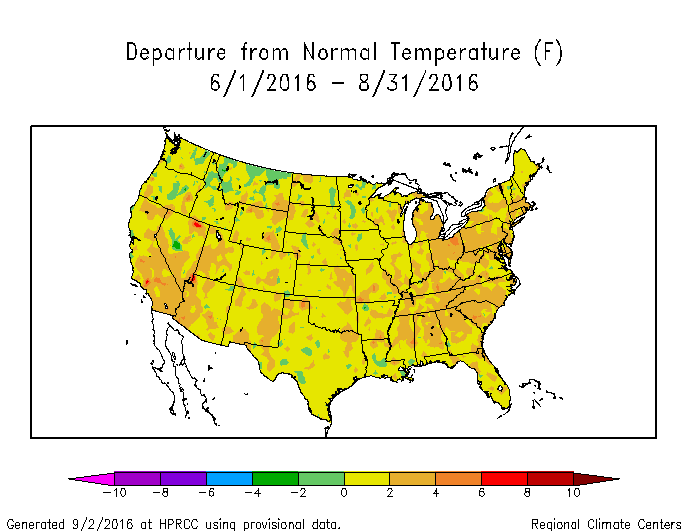 In summation, this summer of 2016 will go in the books as a very warm to hot one for the country, and an especially hot August for the Eastern US.